Managerial Leadership Practices based on the Time Span research of Elliott Jaques. “What happens when you do the training?” I asked. “Yes, and every time we go round, the push-back gets stronger. They seem to hate the training,” Crystal said, shaking her head. This entry was posted in Accountability, Learning and tagged learning, training on March 29, 2019 by Tom Foster. I believe it is probably the way the training is presented and who is providing the training. The training should be presented as enjoyable and if the employee knows he/she will get written up, then that is a issue right there. Additionally, everyone does not learn the same way – different learning curve as some of them take longer to absorb the knowledge than others. People learn by doing, but in a test environment it is different than the real environment, I would suggest the trainers sit with the person on the floor doing the work, so they understand the reality of what is happening with that person as the people understand how the system works, my observation is that the trainers don’t understand what the person doing the work is up against and the multitasking it may take to get that information entered into the system. Buy the book. A gripping tale of organizational growth from infancy through go-go, adolescence and prime. Our most popular online workshop. 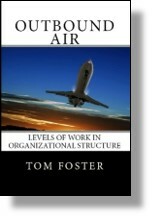 This is the management science in Outbound Air. Time Span 101. Buy the book. The only book on hiring that blends the research on levels of work with the discipline of behavioral interviewing. Take the course. Learn how to apply levels-of-work in the behavioral interview. Find out more about our online program - Hiring Talent - Online.